Select Active Layers is used to set the layers required to be active or view the active layers in the current working environment. 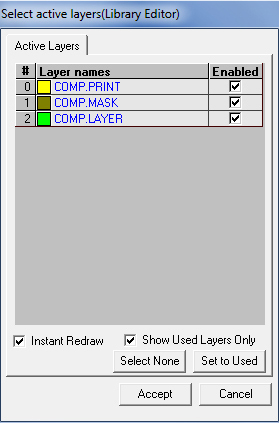 A new option Show Used Layers Only is incorporated, which displays the used layers alone in Active Layer Window. Selecting the check box Show Used Layers Only displays only the layers used. The function Renumber Entries allows renumbering the entry points in a desired order. While renumbering, if any pin is missed or a pin is wrongly assigned, a click on the wrongly assigned component entry pin removes the pin numbering from that specific pin onwards. Click again on the component entry pins to renumber .